donkeyboy: drama under the bigtop! Welcome! Welcome! Ladieeez and Genlemun! Sure to excite and stimulate, leading a madcap display of danger-defying feats of skill and audacity, in the center ring, the deacon of derrring-do…iiiiiit’s…DONKEYBOY!!! Wooo…the tension is getting thick! Even with the whole circus behind him, can donkeyboy stand up to the merciless ridicule of the bully? Be sure to come back next Monday for the thrilling conclusion of DONKEYBOY! 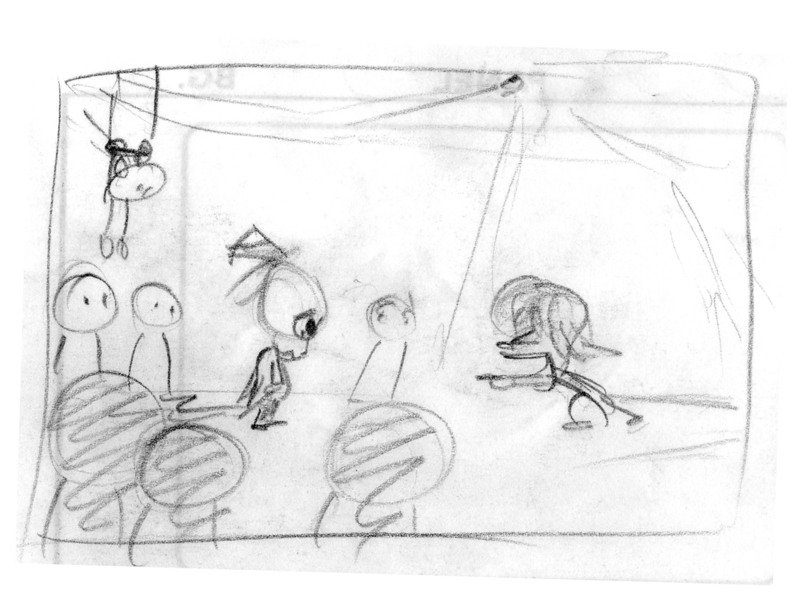 Couple notes on this week’s panels: The first two represent indecision on my part on just how to depict the inside of donkeyboy’s bigtop. I wanted it to be magically way larger inside than it should be from what it looks like on the outside. 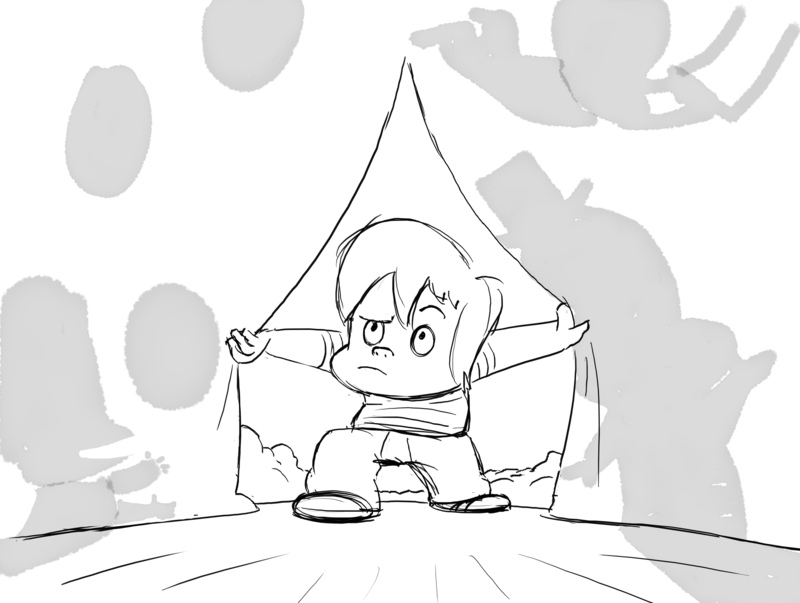 The first panel has that fish-eye perspective to show the extreme size of the tent inside, but, unfortunately, the characters become really small and hard to see. 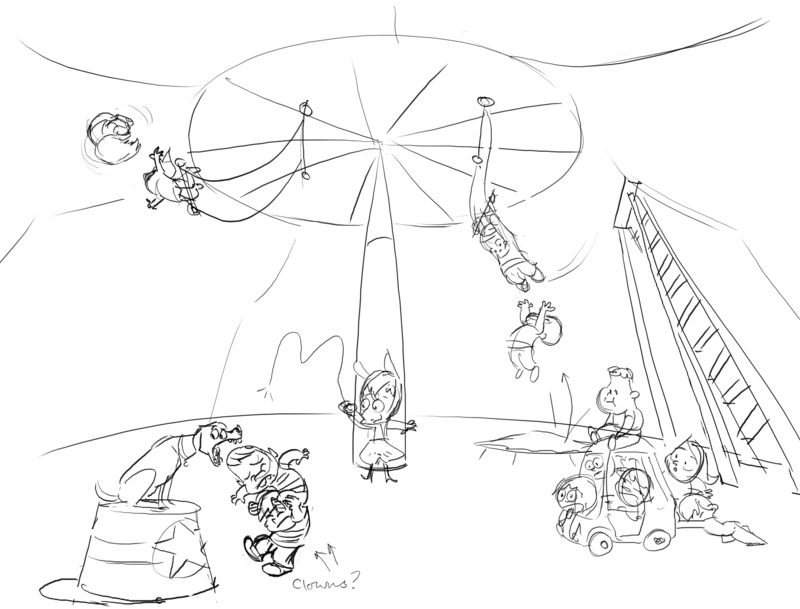 The next panel is a more flattened composition that exists mainly to show the silly ways that the kids try to perform different circus acts (the clown car with a plastic play car, the lion-tamer with one of the dogs, etc.) I still haven’t resolved this, but what I might do, is treat the first panel with a high contrast lighting scheme, because remember, I’m only using blacks and whites, so there will be no gray-tone spotlight. 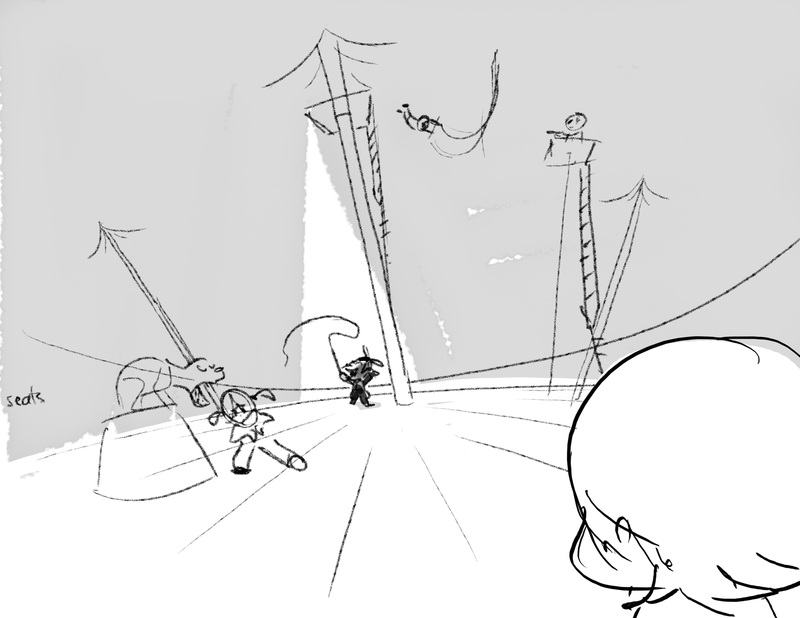 If I put most of the shadows into full black with just a few rim-lit objects in the shadows to suggest what the rest of the kids are doing (revealed in full in the next panel,) it would provide a really nice, dramatic reveal for donkeyboy as the master-of-ceremonies. I would love to hear any of your thoughts in the comments section!